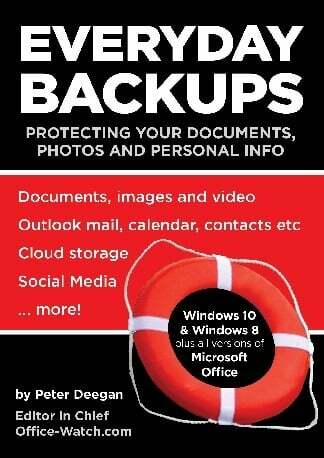 Everyday Backups – protecting your documents, photos and personal info. A practical guide with plenty of ‘step by step’ instructions for both backup AND restoring files. Your computer, cloud storage and social media. Use commonly available tools that you either have or can get for a low price. Everyday Backups helps you keep your documents, settings and emails safe, and get them back when things go wrong. From the makers of acclaimed guides to Windows 10, Office 2016, Windows 8.1, Office 2013 and the Office Watch newsletters. Everyday Backups is about recovering things you thought were lost with the focus on documents, files and emails used by Microsoft Office programs. Windows 10, 8.1 and 8. Office 2016,Office 2013 and earlier Office for Windows. PDF format, compatible with Windows, Mac, Apple and Android tablets and pretty much anything else including iPads. Make a backup right now, it only takes 10 minutes to setup two free backup methods that work together and automatically. They are free with Windows but hidden away, sleeping, until you awaken them. There’s a lot on your computer that you’d hate to lose. A lot more than you’d realize. Everyday Backups will help you find and copy all those personal details. Do you have a backup of what’s on OneDrive, Dropbox, Google Drive etc? Those services aren’t perfect and have been known to lose files. You need your own copies of what’s ‘up there’ in the cloud. Facebook, Twitter and Instagram can have a lot of precious memories. Photos and videos from your past that are saved nowhere else. Everyday Backups shows how to get copies of all that information and, if possible, do it automatically in the future. Ransomware is a nasty type of virus that can lock you out of all your personal files; documents, pictures, videos and more. Even standard backups can be attacked by ransomware leaving you with no way to recover from an attack. Everyday Backups explains how ransomware works, the problem it creates for backups and how best to protect your backups. Dive deep into File History, the single best feature in Windows 8 and Windows 10 but little appreciated and even less used. There’s still a Windows Backup utility, we’ll help you find it and go ‘step-by-step’ to make complete Windows backups. ‘Roll our own’ – make your own backups and schedule them to run automatically including the Windows Registry and databases. Outlook is a special case. It has large files plus settings saved in different places. We’ll show you how to fully backup Outlook. Most of the tricks we’ll talk about also apply to other programs and situations, they go into Office features that can help recover lost data but are not normally included in simple ‘backup’ coverage. As with all the Office Watch ebooks and newsletters, we’ve tried to go beyond the standard software ‘how-to’ to give you practical advice and tips we’ve learnt from decades of computing experience.” said author and co-founder of Office Watch, Peter Deegan. We all know the importance of backups – inevitably you lose something you wanted, either in the short term or from years past. Most writings on backup assume everything works fine. You buy that – then do this and this – hey presto, you have a backup! There’s little talk about restoring files and almost never anything about what happens when things go wrong. The Everyday Backups takes a practical approach after many years of saving and restoring files. We know that restoring has to happen at the worst of times. Your computer hardware or software might not be working properly (since that’s why you need to restore data in the first place) and you might be under time pressure (computer failures will delay that important task you have). We’ve written a practical guide with plenty of ‘step by step’ instructions for both backup AND restoring files. We’ll show you how to do this with commonly available tools that you either have or can get for a low price. Everyday Backups works for Windows 10 and Windows 8; any version of Microsoft Office.